Could You Give It All Up to Chase a Dream? I had an interesting conversation with a new neighbour of mine a couple of weeks ago. He is from the US and I am from the UK but we have something in common; we both gave up a fairly comfortable life in order to chase a dream. His story is more interesting than mine, as he gave up a good job to come down here to Tarija in South America with his young family. By the time I bumped into him one day in the main plaza they had been here for a few months, used up most of their savings and were working out what they were going to do in order to survive here. Even in that difficult situation they were determined to stay here and chase their dream of living in a different culture. This story got me thinking about what makes people give it all up in order to do something like this, while others wouldn’t dream of doing it. What are the possible benefits of giving up your job and starting out all over in a foreign country where you don’t have great job prospects and don’t even have the language skills to order a meal? In my case, I left the UK back in 2003. I didn’t have any strong reasons for doing so but I knew one thing for sure; I didn’t want to live with regrets in the future. I had always wanted to see the world and I was getting nervous about living the next 30 years or so in the same place and working in the same bank. I felt that it must be horrible to look back on your life with regrets and I think that this probably pushes more people on to do something exciting than you might think. I can clearly remember sitting in a park one day and thinking to myself, “It is good to give it all up and start again at least once in your life”. Maybe you don’t agree with me but here’s my thinking. The more you have the more you worry about losing it. Before I left the UK I had a rubbish car and a house which was alright but not worth losing any sleep over. However, I was stressed out about interest rates, accidents, robberies, natural disasters, wars, nuclear bombs, unemployment, fraud and about the possibility of losing what I had built up over so many years. By letting go at least once in your life you can relax a little in the future because you realise that the world didn’t stop spinning on its axis just because you didn’t have a lot of possessions. It is all working out great for my new friend now. I gave him the details of how to work online like I do and he is now earning what is a fantastic wage for this country. This isn’t a fluke or a one off. I genuinely believe that if you take a chance and give it all up then it works out better for you in the end. I’ll give you another example. After I left the UK I spent a year wandering about the world and when I went back again I got far better jobs than ever before. I then gave it all up again to move to Spain and got an ever better job and lifestyle. I then gave it up for a third time to move to here, which is where my wife is from but where I had no idea how I would earn a living. I now work as an internet freelancer and earn enough to have the best lifestyle I have ever had. 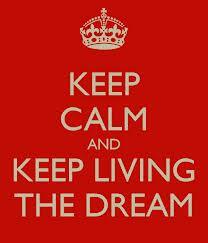 If you chase a dream it will work out in the end and you will end up financially stable again. Of course, that doesn’t mean that it is right for everyone but if you have a dream then chasing it is an option. Would you give someone a quote without seeing the job first? 10 Responses to Could You Give It All Up to Chase a Dream? You know Robert, the older I get the more I realize how marketable I am. I’m not quite there yet, but I think that pretty soon it will be very easy for me to give up my “normal” career path for something more innovative and exciting. Thanks for the encouragement! “I knew one thing for sure; I didn’t want to live with regrets in the future”. This is going on a post-it next to my computer!! I chased my dream from the start rather than giving something up to chase it. Well I guess I gave up the possibility of stability. I’m glad with the choices I’ve made and the experiences they’ve given me. As my dreams evolve it will be interesting to see how that shapes my future. That’s great to hear Stefanie. Dreams have a habit of turning into something completely different from what you expected them to be. I’ve noticed that the only thing keeping me from giving it up is the shackles I put down myself. I’m taking baby steps right now, but I’m a pretty impatient SOB so it’s driving me crazy! I don’t mind moving around a lot too, the next move is always easier. And employers value flexibility, and if you can speak several languages, even better.